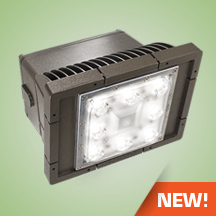 The FRG is a high power LED flood light designed to perform and built to last. High performance optics maximize light intensity to provide consistent and uniform light patterns for a multitude of commercial, industrial or residential lighting applications. The heavy duty housing is constructed of diecast aluminum. The optical assemblies are sealed in place using a silicone gasket for weather tight protection. Sealed wireway with anti-siphon leads. Made with a state of the art UV stabilized acrylic high performance refractive optical assemblies that use high transmissivity materials to achieve precise photometric distributions. Available in Type V Narrow, V Medium, and V Wide, and NSP beam configurations. Available in 5000K-70 CRI Cool White (+/- 500K) or 4000K-70 CRI Neutral White color temperatures propagated with Philips Lumileds Luxeon MX LED’s. Available with 100-300V 50/60 Hz Class II power supply. LED’s rated for over 50,000 hours at 25°C ambient temperature. 347V~480V input option available. 0-10V dimming. Built-in surge protection up to 10 kV. Built-in Active PFC Function >95%/Full load. LED Power Supply conforms to UL8750 standards and is IP65 rated for wet locations. 0-10V dimming standard. Standard mounting option available is a 3/4” threaded knuckle mount or adjustable yoke mount. A tenon mount adaptor is available for mounting onto a 2-3/8” OD tenon (see Accessories). ETL Listed. Suitable for wet locations. Meets US and Canadian safety standards. -40°C to 50°C ambient operation. RoHS Compliant. The complete luminaire is covered by a 5-year limited warranty.